For residents of Jupiter, West Palm Beach, and Palm Beach County, there is a solution out there for those suffering from dry skin, wrinkles, and other skin problems. Our aestheticians Amanda Sanzone and Kayla Angst perform HydraFacial MD® procedures that can eliminate some common skin issues. HydraFacial MD® is a non-laser skin resurfacing treatment using the latest in technology to cleanse, exfoliate, hydrate and protect the skin – all together. The end result is clearer, softer, more luminous skin with zero discomfort or downtime. Your face feels soothed, hydrated and touchably soft. What’s more, the HydraFacial MD® treatment helps diminish the look of fine lines, wrinkles, and large pores while clearing up oily, acne-prone skin or hyperpigmentation, and brown spots. It’s safe and effective for all skin types, including thin skin, aging skin, ethnic skin, dry skin and more. Because of its full spectrum exfoliation and cleansing process that naturally brings new, fresh skin cells to the surface, it’s a great step to help prevent the look of aging or tired skin, saving you from needing more invasive procedures such as Botox® or dermal fillers. A HydraFacial MD® treatment offers a wide range of instant benefits for giving you softer, clearer, healthier looking skin. Large pores, oily skin, and uneven skin tone are visibly lessened while the pekid, tired-looking skin tone (a tell-tale sign of aging skin) is considerably reduced. HydraFacial MD® doesn’t just treat the surface of the skin – but rather below the skin’s outermost layer, helping to reveal softer, younger-looking skin hiding beneath dirt, oil, pigmentation and other common skin issues that are preventing you from looking your best. One of the best reasons to consider a HydraFacial MD® treatment is that it’s safe enough even for sensitive skin! Because of its gentle cleansing and clean burst of healthy antioxidant goodness, your skin will feel better than it has in years! Dry skin by removing dead skin cells and quenching thirsty skin. A HydraFacial MD® treatment firms and tones the skin, improving its texture and the skin’s overall health. Dry, wrinkled, or dull skin can make you appear older than you feel. Sun damage and other environmental factors age our skin, sapping it of the moisture and natural nutrients that keep it smooth and glowing. Even for young patients, dullness can undermine the look you want to achieve. A HydraFacial MD®, stronger than a basic facial but gentler than skin resurfacing, is a relaxing way to combat those concerns. Antioxidants:These key chemicals help protect and repair skin cells by isolating damaging free radicals. Peptides:These amino acids boost the production of collagen and elastin, which help keep skin looking smooth and youthful. Hyaluronic acid:Naturally produced by the body, hyaluronic acid is responsible for giving skin volume. Our aesthetician can customize your treatment to target your precise concerns. Exfoliation:A cleansing serum removes dead skin cells while gently cleansing to remove dirt and oil. Peel:A blend of glycolic and salicylic acids works like a superficial peel, loosening dirt and other impurities without causing redness or irritation. Extraction:A patented suction tool clears out pores without pain. Hydration:A serum delivered into the skin using a special handheld tool provides lasting protection and nourishment that keeps working after the treatment has finished. Because the treatment is non-invasive and gentle, our patients can immediately resume their daily activities after completing the procedure. There’s no downtime, no complicated skincare regimen, and no discomfort during the process. Watch as our very own Dr. Supriya Tomar gets her monthly HydraFacial! 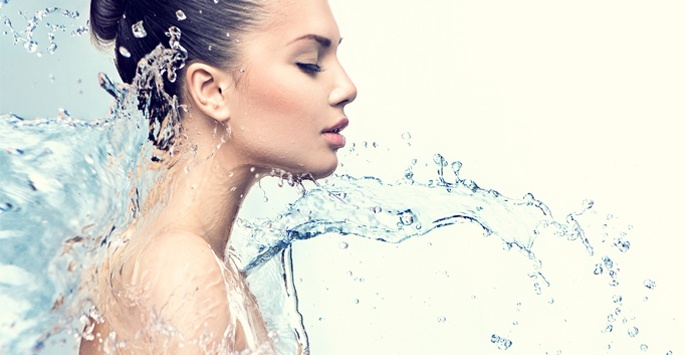 One of the major signs of healthy, youthful skin is its hydration. Of course, many moisturizers and creams add skin-sapping chemicals that clog pores and leave skin feeling greasy. A HydraFacial MD® treatment strips out all the stuff your skin doesn’t need and delivers safe, gentle and effective goodness your skin will love! Am I a candidate for the HydraFacial MD® treatment? The HydraFacial MD® treatment is designed for all skin types. Even the most sensitive skin easily tolerates the HydraFacial MD® treatment. Our skin care professionals may custom-blend the treatment serums for your unique skin condition. Talk with our office about your skincare concerns and we’ll create a HydraFacial MD® to help you look and feel your best! The HydraFacial MD® takes approximately 45 minutes. There is no discomfort during the procedure. It is often described as feeling like a “cool paintbrush moving slowly over your face.” You may put on makeup and return to normal activities right after the treatment as there is no downtime. Why choose Supriya Dermatology for HydraFacial MD®? With years of experience in helping patients of all backgrounds and skin types look and feel their best, Kayla, our aesthetician and skin care specialist, is the perfect choice for administrating your HydraFacial MD® treatment. Every consultation is dedicated to helping you better understand your concerns and give your skin the best possible care in an atmosphere that’s comforting, understanding, and compassionate about your care. You deserve the very best of care using the latest technology for skin resurfacing and rejuvenation, and that’s why you deserve a HydraFacial MD®. How Much Does HydraFacial MD® Cost? Skin rejuvenation treatments are considered to be elective, so most insurance providers won’t cover the costs. To help make HydraFacial MD® affordable and accessible for everyone, Supriya Aesthetic Dermatology offers financing options via CareCredit®. We also accept cash, personal checks, and major credit cards. Contact us today if you have any questions about the cost of HydraFacial MD®. HydraFacial MD® is offered at Supriya Aesthetic Dermatology for those who live in Jupiter, West Palm Beach, and all of Palm Beach County. Those interested in a consultation can contact us at 561-805-9399 to make an appointment.